Easily capture data with a drone. Scanifly works with any drone that captures geo-tagged photos. Upload geo-tagged photos directly to Scanifly. The Scanifly Cloud automatically generates a 3D model of the property. Design using a virtual replica of the property directly in Scanifly. Add solar panels, simulate production, export shade reports and more. Already using a drone in your operations workflow? Impress your customers with arrays built on a virtual replica of their home or business. Simulate production using NREL's PVWatts. Say goodbye to the SunEye. 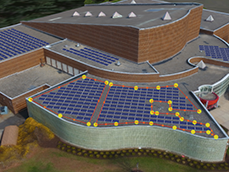 Generate solar access viewsheds without stepping on the roof. Generate shadows using a virtual replica of the site. Use the ruler tool to measure those hard to determine z-axis measuements. Use the protractor tool to determine the correct tilt of the roof. Design for proposed structures using your SketchUp 3D models and a 3D mapped environment. View tree heights at a glance, and view change in topography. Export a stunning proposal with an image of the PV system in Scanifly. 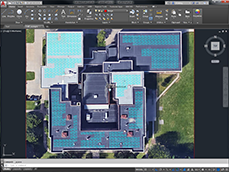 The first and only shade report with a drone's eye view of the roof(s), with viewshed reference points. Export a 2D .dxf file. Embed your 3D models with arrays on your website for everyone to see! Not flying a drone, yet? Let Scanifly do it for you! Our network of FAA certified remote pilots are trained to safely capture data for solar applications. Or inquire with us for upcoming seminars and in-house workshops. © Copyright Scanifly, Inc. 2019 | Made with ❤️ in the U.S.A.